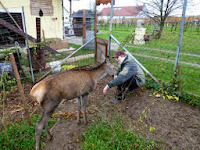 My new life in Burgenland: Having A Cuddle With My Deer Friend Ben! It's not often that we get to be close to these animals that we either see in movies or learn about in school. 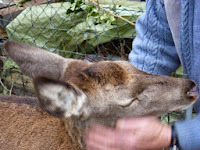 Deer are notoriously fast on their hooves and even seeing one close up is difficult. 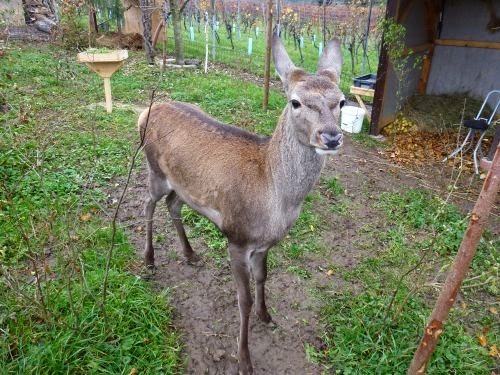 He was found on the road as a baby deer. 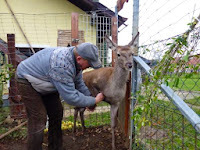 The local Hunter, Stefan, was called to collect the baby deer. There was no sign of his mother and he would have starved had it not been for Stefan. You couldn't get a better carer. At times he even got up 5 times a night to feed Ben...here is a link to my blog post about a really small Ben! I hadn't walked past Ben's new home for a while and when I did yesterday morning, I saw that Stefan was feeding him. Of course I stopped to say Hello. Gosh, I couldn't get over how much Ben has filled out. But a honey nonetheless. He came over to me and if I didn't know him as a deer, I would have mistaken him for a friendly puppy. He rubbed his body against me just like dogs do. I tried the trick of rubbing behind an ear and it worked like magic. Ben loved it. He even posed for me but got so nosy as to poke the camera. 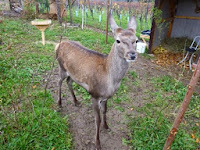 An inquisitive soul, but as friendly and loving as can be. Here is Stefan massaging his foreleg. 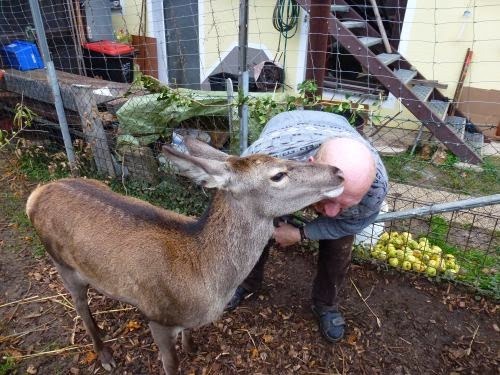 Stefan just loves this deer and you can see that the deer loves Stefan. Have you ever seen anything so cute? Earlier I did the same and Ben was snuggling up to me for more ear stroking. Stefan and Ben. It was such a treat for me to be around them for a few minutes yesterday. Really nice.